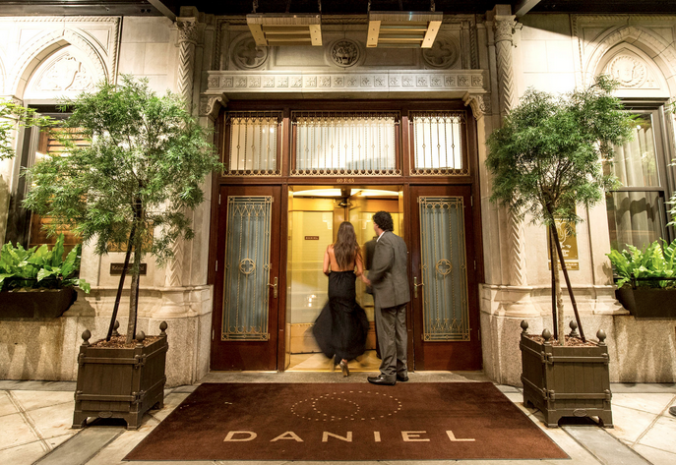 Some years ago — not too many years but two or three eyeglass prescriptions ago — I walked into a restaurant in New York called “Daniel.” I navigated a phalanx of paparazzi to enter the establishment on East 65th Street, but the buzzards were not circling on my account. I was in the company of the Governor of California, who was in turn on his way into Daniel to enjoy dinner with the Governor of New York. This was before their respective scandals, and it was not in the cards for me to stay in my governor’s wake beyond the steps into the main dining room. The owner of Daniel, M. Daniel Boulud, a chef generally considered to be in the top tier of such people worldwide, stood to the side while his illustrious guests were escorted to their seats by the liveried staff. Finding myself a foot away from him, I introduced myself as Gov. Schwarzenegger’s aide, mentioning in the process that I had for a time cooked for a living and admired him very much. He accepted my compliment graciously, bowing a tiny bit as he shook my hand and curling his lip in a not-too-dismissive Gallic manner. Knowing that I had a couple of hours to kill while my “principal” dined, and not wishing to kill the time in the back seat of an SUV that had been rented by the California Highway Patrol, I asked M. Boulud if he might be able to find space in his bar where I could, in the company of my friend Kevin, the governor’s director of advance, possibly have a tidbit to eat. Monsieur le Chef said he absolutely could make such an arrangement for Kevin and me. He gestured to an underling — I cannot reliably say whether he snapped his fingers or not when summoning said underling — and motioned us toward the bar. I believe he pressed his hand gently against the back of my left shoulder in the process. The underling led us to a cozy nook in the bar, where he guided me to a settee with my back against a wall and Kevin to a tuffet that another underling had elegantly slid into place on the opposite side of a small coffee table from me. Kevin and I hunched over the coffee table like apes in that early sequence of 2001: A Space Odyssey, waiting for someone to bring us the menu of Tid-bits du Bar or Petits Morceaux de Joie. A waiter did indeed bring us menus, but lo! were we surprised to see that they were the same menus the guests in the dining room received. No tid-bits and no morceaux. This was the dinner menu. Accepting that it would have been impolite and gross to back out at that point, after M. le Chef himself arranged for us to be seated, we ordered what seemed the simplest thing. La Sélection du Chef offered seven courses of excellence, and it was the smallest amount of excellence available to us. “Can you pay?” Kevin gulped. We ate our seven courses, though I could not, even if pressed, explain now what they were. Kevin and I, as a good advance man and Body Man, respectively, remained focused on our so-called principal. Still, with an eye ever toward protocol, and not wishing to bring embarrassment upon our employer or the 38 million people who paid our salaries, we thought it best to accept the waiter’s offer of the so-called “wine tasting” with our dinner. With at least five of the seven courses, wine appeared on our coffee table, and we drank it in our bent-over state. While hunched over our elegant ottoman, we gobbled and slurped quickly, not wanting to be found lounging in a bar when our immediate supervisor was ready to depart the restaurant. I could not this day say what I ate or drank that evening, and I doubt that Kevin could, either. The tab, though, ran upwards of $700 for the two of us. As soon as the pâte de fruit, macarons and gourmandises were delivered to us, I asked for the check. We simply could not risk being left in the restaurant when our “boss” was ready to leave. We did not lounge over Cognac or coffee. Everything worked out. Kevin and I had gulped our food and drink before the governors rose from their table and headed out to the camera flashes that awaited them. On the way out I introduced myself to Gov. Spitzer, who behaved respectably to me. He held back while Gov. Schwarzenegger and I emerged into the night. I happened to see a CNN program this evening about the gastronomy of Lyon, France. In it there was considerable attention given to M. Daniel Boulud, who hails from the area, and the story brought to mind the interesting dinner I enjoyed once in his New York restaurant.